Affording Ultimate Privacy - this awe-inspiring landscape is without rival! Eighteen impeccably manicured acres present a portrait of natural beauty. Privacy prevails, & a coveted private lane welcomes one to an idyllic country destination. A commanding hilltop position boasts gentle elevations, spectacular western sunsets and a panorama reaching to the crest of the Fox Valley. The drive through a gated entry is captivating & embraces a serene luxury lifestyle. Architecturally designed to capture the amazing vista, this sprawling mid-century ranch home invites you in. Modern amenities are uniquely embodied throughout an eclectic ambiance including radiant heated flooring, 3 fireplaces, marble baths, 5 garage spaces & walls of window - savor the views. A newer West Wing presents an opulent master suite with fireplace & lavish bath overlooking the pool and gardens. With riding trails nearby, this choice location offers ideal equestrian opportunity ... First Time Available! I was searching on Blue Fence and found this listing. 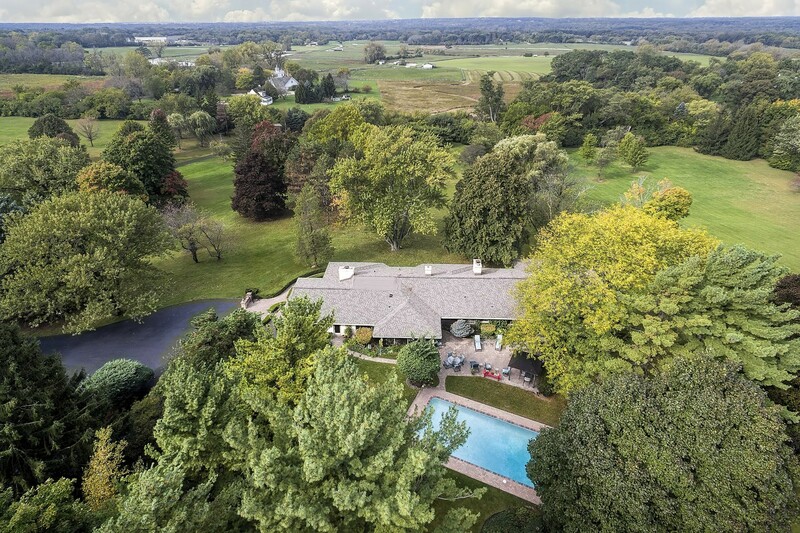 Please send me more information about 126 Brinker Road , Barrington Hills, Illinois 60010. Thank you.